The Department of Energy's Oak Ridge National Laboratory in Tennessee has begun producing plutonium-238, but full-scale production of the spacecraft fuel isn't expected until 2023 at the earliest. 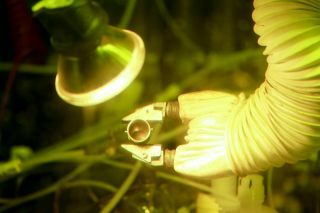 In December, officials at the Department of Energy's (DOE) Oak Ridge National Laboratory in Tennessee announced that researchers at the site had generated a 1.8-ounce (50 grams) sample of plutonium-238, the fuel that powers deep-space missions such as NASA's New Horizons Pluto probe and Cassini Saturn orbiter. "What we're shooting for is to get to an interim production level of around 400 to 500 grams [14 to 18 ounces] per year in 2019, and then full-scale, a kilogram and a half [3.3 lbs.] — if everything goes right — in 2023," Bob Wham, the Pu-238 project lead in the Nuclear Security and Isotope Technology division at Oak Ridge, said last month during a presentation with NASA's Future In-Space Operations (FISO) working group. Plutonium-238 is the key ingredient in radioisotope thermoelectric generators (RTGs), which convert into electricity the substantial heat emitted by the radioactive Pu-238 when it naturally decays into uranium-234. Savannah River stopped making Pu-238 in 1988, as the Cold War wound down. In 1992, the United States started buying the stuff from Russia, but the last such foreign shipment was received in 2010. Since then, U.S. stores of Pu-238 have been dwindling. For more than 50 years, NASA's robotic deep space probes have carried nuclear batteries. See how they work here. RTGs like the one powering NASA's Mars rover Curiosity use 10.6 lbs. (4.8 kg) of Pu-238, so right now there's enough of the stuff to power perhaps three more such deep-space missions, DOE officials have said. The activities underway at Oak Ridge are therefore designed to avert a possible shortage and keep NASA spacecraft cruising through deep space for decades to come. NASA officials have said 3.3 lbs. (1.5 kg) of new Pu-238 per year should suffice to accommodate the agency's needs. As you might expect, the production of Pu-238 is complicated. First, the Oak Ridge team receives shipments of radioactive neptunium-237 from Idaho National Laboratory (INL), another DOE facility. Engineers then process the neptunium into "targets," which are blasted with beams of neutrons in one of two nuclear reactors at Oak Ridge, Wham said. This creates Pu-238, which is then chemically processed and shipped to a third DOE site, Los Alamos National Laboratory in New Mexico. Los Alamos personnel further process the stuff, creating encapsulated "pellets" that are then shipped to INL for integration into RTGs. The power systems are tested at the Idaho site, and, if all goes well, they are then shipped to NASA's Kennedy Space Center in Florida to be prepared for launch. The restart of Pu-238 production hasn't made it to these latter few steps, however; Oak Ridge is still figuring out the best way to manufacture and process the plutonium. The team can't simply copy what was done at Savannah River during the Cold War, because the facilities involved are quite different. The restart team is also trying out a new processing technique, one that relies on solvent extraction as opposed to exchange columns, Wham said. Savannah River identified solvent extraction as a good way to reduce both costs and waste back in 1977 but never adopted the technique, he added. "At the time, it just wasn't that important to them to do that, because this was a small part of the overall mission to produce plutonium for weapons," Wham said during the FISO talk. "We've adopted that [solvent extraction] as being kind of our baseline, because we want to reduce operating costs, and reduce the waste." The wheels of the Pu-238 restart are turning. Oak Ridge has already made some plutonium, after all, and the lab shipped two small samples (0.2 ounces, or 5 grams each) of the stuff to Los Alamos earlier this year, Wham said. It will take considerable time and effort to validate all of the procedures involved and get fully up to speed. For example, the team is currently testing a way to increase yields and significantly reduce the number of neptunium-237 "targets" needed, by using pure neptunium-oxide pellets clad in zirconium alloy as opposed to a neptunium oxide-aluminum mix. "It'll probably be another year and a half before we have sufficient information to make a decision on whether this is worth pursuing and scaling up into target design," Wham said. But the team should be able to start producing the NASA-requested 3.3 lbs. (1.5 kg) of Pu-238 per year by 2023, if everything goes well, Wham said. And that production should continue indefinitely, provided the will and the funding don't disappear, he added; the nation stockpiled hundreds of kilograms of neptunium-237 during the Cold War. "We could make new plutonium-238 for a very long time with the current amount of material that we have," Wham said.